When I was a child, I had moments of knowing I was connected to something greater than myself. Today, with my adult brain, I would describe these moments as feelings of Oneness or Unity or Whole Love. At the time though, I was not thinking of it in quite that way—I was a kid; all I knew is it felt right, it felt like my body was in a current of flow that went on forever. I think children in general have greater access to feeling “in the flow” than adults: they have not built up the emotional and mental barriers that get in the way of this flow. One such moment for me was when I decided to try to meditate. I was probably 13 or 14, and had never been formally introduced to meditation or eastern philosophies. My sister was my biggest influence; she was reading the Seth books by Jane Roberts, the “Tao Te Ching” by Lao Tzu, and other such books and I, as the little sister, followed and wanted to know what these things were about. I read about Tao and flow, and consciousness and “reality”. There was something there I was learning, that was shifting something in me. Somewhere, I don’t even really know where, I came across a description of meditation—upside down. It seemed as though the meditation posture was intended to be uncomfortable and since I come from a Catholic background, where pain is incorporated into the atonement of sins, it just made sense to me that meditation would be the same way. I had already had feelings—moments—of feeling the flow, and thought meditation would help me figure out how to do it more often, so I tried it. My head on a pillow, up against a wall in my bedroom, I did a headstand. Mind you, I had not read any “instructions”, any pointers, or any warnings of “don’t try this at home.” In other words: I did not know what I was doing! But I knew what I wanted to achieve. I closed my eyes and sat (stood?) there… And sat there… And sat there… I may have passed out. I may have fallen asleep. I don’t know…but I knew when I “woke up” (returned to consciousness; re-entered my body?) that I had succeeded! I was so calm, peaceful, and happy. My body hurt like heck, but that to me was just a symbol of the success—I achieved surpassing the bodily aches and was totally absorbed in the flow of the mind—and I had done it intentionally. It became purposeful for me when I realized that being in the flow changed my performance on the basketball court. Basketball was very much a part of my personal identity, starting in fifth grade. My sense of self, my feelings of success or failure, my self-esteem, were very much tied to basketball. I read about diets for athletes, and did what I could to follow them; I read books about basketball drills, and practiced by myself almost every day in the off-season; I ran and lifted weights, all to be as good as I could at basketball. But basketball—as with any sport or activity—is as much mental as it is physical. I trained my body, but did not know how to—or even that I should—train my mind, or improve my emotions. That happened coincidentally, the incidental convergence of my pursuit of “flow” on the one hand and my pursuit of basketball on the other. Many of the games would start at eight o’clock in the evening; often we did not get back from away games until eleven. I have always been an “early bird” and turned into a pumpkin around 10; I had to do something so my body would be able to stay awake, so I took naps. After one particular nap, I woke up with that feeling of clarity, joy, and flow I had experienced several times before when “meditating”. I played a great game; it was so freeing! Now, there was a correlation between that feeling and my activity. Now I had a reason to pursue that feeling: it made me a better basketball player. After that, when I would nap before a game, I would try to do the same thing, try to recreate the same result. I never really got the same result. I don’t know what I “did”; I did not know how to replicate the experience. I would replicate other actions as well—taking baths, walking at night, breathing, “meditating”. Sometimes it worked, sometimes it didn’t. I never really knew what made it happen, what caused the feeling of being in the flow. It frustrated me but it made me expand my exploration. I still had those moments, but they would not come on demand; they would only come, it seemed, when they wanted to. I have been practicing and learning to cultivate that feeling ever since, and I now call “that feeling” transcendence, or enlightenment. Whatever the word, the effects are the overwhelming feelings of being in a flow, of clarity, of love, peace, wholeness, completion, trust, and happiness (not always all at the same time). 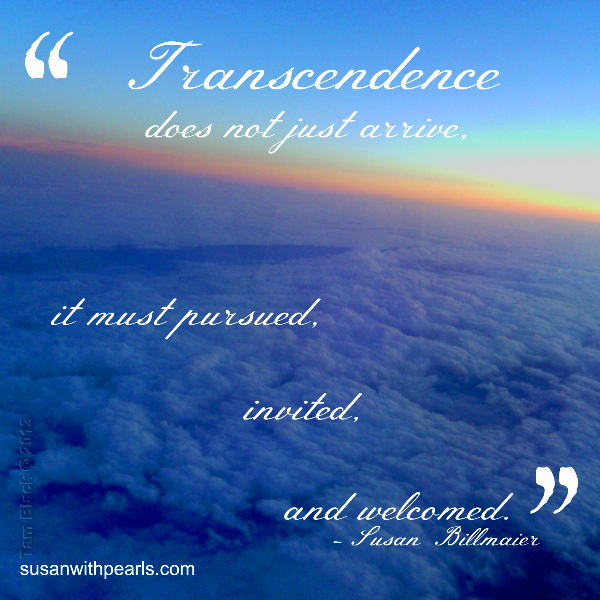 In a broader sense, transcendence is connected to a very solid, practical, purposeful goal. Beyond basketball, it became applicable to life, because I noticed that when practiced and pursued consciously, the effects slowly expanded, making life’s activities, relationships, and choices clearer, more peaceful, more gentle. Jesus and Elijah transcended into Ultimate Transcendence; many Christian mystics and saints have transcended (and probably many unknown lay-people who never made it into the history books). Shakyamuni Buddha became enlightened, and entered Parinirvana; many historical Buddhas became enlightened. One of Buddhism’s main tenets is that we all have the possibility for enlightenment in this lifetime. lovely truth put very simply…although i haven’t deconstructed my pathway as you have yours,i’m there and it does free one and much more . thanks kid !! love.